Okay, I'm only 10k KGS, I don't pretend I know much about anything, and certainly don't know any real answers to anything, however, I believe that 10k is still more than enough at teaching people from 18k-30k, and that's what I spend my time doing when the mood strikes me. I'm no Go Teacher, but, for beginners, I think I make a decent Go Tutor. I do all my teaching on KGS, never taught someone in person, nor brought someone to the game that I can recall. This page here exists because I've noticed that I teach roughly the same sort of things to beginners to help them in their quest to improve. And for better or worse, I'm putting what I've been teaching up for public scrutiny and comment. In fact, I Strongly encourage comments. Anyone should write whatever they want to, good, bad, or just stories and other experiences, if it's related to understanding how to make teaching better, comment! My greatest experience in teaching go has been teaching players of around 25k-30k. Usually people who have just read the rules and played a few games. At this point in their development, there is far too much for them to learn at once, so the goal above all else is to prevent information overload. So if you see that I "leave things out" or "get things wrong" in beginner lectures, 99% of the time, it was on purpose. I'm open to debate about whether leaving something out is a good idea or not. Next, I'm wordy. A regular windbag. I do it without thinking and to make things worse, I use complex sentences. I know some students can't handle it, some get bored, some aren't native english speakers, etc.. To those people, I apologize right now, but perhaps I can't help you as much as I'd like to. I'm very well aware that I have so much more to learn myself. And so, I'm wary of teaching things that might prove wrong as one moves up through the ranks. What I teach might be wrong anyway, but I really worry polluting my student's mind with incorrect dogma and making a future teacher's life difficult. Remillard - I think this is really important. Not so much because of making a future teacher's life difficult, but... how do you know? Even dan players get to positions where they say they do not know what the best play is. So, best perhaps to stay away from that sort of thing, unless you are in a very intense game review where you are tearing apart everything you can find. For most players, getting the right *idea* is half the battle. Finding the best move is secondary. If you can get into the ballpark, then over time, those points that work and don't work will resolve themselves hopefully. But if the person has no way to even think about a position, then their brain is going to be so scattered that nothing is going to make sense. I have a saying for that sentiment, one that I use as the foundation for how I teach. Play whatever you want, just know what it can do, and what it can lead to, and then make it work for you. Because of this worry I have, I feel all teachers, especially us kyu teachers, should firmly keep in mind one rule. Whatever you teach, don't teach in such a way that it makes a future, much stronger, teacher have to work hard to tear down the things you taught. Finally, I once had the opportunity to quickly ask Minue whether he felt it was a good idea to teach only 3 things to 20ks, namely 1) Corner-Sides-Center, 2) Cutting and Connecting, and 3) Basic shape. Minue's response was that it was a fine idea, and so I've been following that sort of recipe throughout. Normally I use the teaching game interface of KGS and play everyone on 19x19 through a whole game, or until lots of questions come up and it feels like a good place to start. Occasionally, depending on how much prexsiting knowledge the student has, I'll use a 9x9 instead since games are much quicker and less overwhelming. Once the game is over, there's a review, and frequent side explanations to illustrate certain concepts. Usually the review doesn't go through even half the game since so much material is covered already early on. Learning about the endgame can wait for a little while longer. Style-wise, I tend to talk a lot, perhaps far too much, so I frequently pause to make sure they're keeping up with me. I also focus as much as I can on explaining the rationale behind moves. I feel that any student anywhere would be much happier and much more benefitted when they get hints at how to find those magic moves stronger people seem to use on them, than just having them shown like magic tricks. So I try very hard to express my reasoning when I'm able to. This introspection is also what I get out of teaching, since it's good to look hard at why you do something. Remillard Thought this might be an interesting topic to address as well. These ideas are really well thought out, but it seems to me that the focus is on a game played after someone asks for a teaching game. I think there might be a stylistic difference for on-the-fly game reviews, ones where you know you'll probably never see the guy again, but want to get something across. Life and Death - or simply, capture. The notion of Health - Remillard I tend to use ideas I've gleaned from watching Shygost teach through the years. Focus on *health*. What's healthy? What's un-healthy? Then weave that into the three basic ideas, keep yourself healthy, abuse the unhealthy opponent, and look for big places. I don't really come across students who have never played a game before, but I have taught a few that were still playing essentially randommly on the board. For those who play seemingly randomly, I normally start off on a 9x9 board and demonstrate the capture rule, letting it naturally culminate in the "2 eyes are alive" discovery and make sure they have an idea of what an eye is and why exactly they need two of them. And as far as I'm concerned, seki, ko, none of that even exists unless the students ask about the situation themselves. One problem that I've come across is the phenomenon where they will fill in their own territory in order to make two 1-point eyes. If that comes up, I take them aside and try to show how a piece of territory is nothing more than a big eye or two. Other than the utility of having 2 eyes, I don't focus too much upon the details of life and death, just "2 eyes are needed to live" is enough for the moment. From here, we can head towards the first real "lesson", what I fondly call my "beginner's spiel"
This is probably the first lecture I give everyone I come across. The actual topics that come up depends on whether the student knows about it or not, but I use it as my default for beginners, as a way of making sure I'm not assuming some knowledge that doesn't exist. First, like in the housecleaning section, life comes first, since nothing really makes sense until you have a grasp of capturing and avoiding capture. This is the first thing after houescleaning that I mention on a 19x19, on a 9x9, we jump straight to Cutting and Connecting. One question that comes up very often that I have to answer is "19x19 is so big, where should I go?" Sometimes students ask right out, other times I take it as implied if they open on the 6-7 point or something. I tell them "As a guiding principle, we like Corners first, then sides, then finally the center." This is the traditional line of thinking, and I usually use a version of this diagram to illustrate why, and say "Because it is easier to make territory, or eyes, in the corners, that's why we think they're valuable." Now, I'd like to point out that the diagram looks very territory-centric. Personally, I'm starting to favor the "Go is about maximizing live stones on the board" concept, but from the perspective of someone starting out, it's not as concrete a foundation to work from when I want to explain things like "you don't need to kill to win." I prefer to just leave verbal hints that Go isn't all about territory, but I pretend it's like that early on. (Merging in some good ideas from Coyote in the discussion page) Another way to look at the diagram, in terms of life, is that. the center group is 1-eyed, the side group is effectively 1-eyed, and the corner group has plenty of eyes, regardless of what white can do. This one is the big one that I talk about the most, usually repeatedly, for students of all ranks. So many high level moves, especially in joseki, can be explained by using the cut/connect, threat to cut/connect, that if this wasn't some bedrock fundamental, I don't know what is. I go so far as to exaggerate and say "Just about everything boils down to cutting and connecting" to really drive the point home. I find it easiest to start on small tactical scales. If the student understands about life and death, it doesn't take too much leading to get them to notice that being cut means having to live on both sides. And in the same vein, connecting seems like an important thing because you can share eyes. It usually takes a fair number of games before they really start learning exactly how or when to go about connecting and cutting, but I'm happy that they have it in mind early and often. Of course, we all know that obsessively connecting is a bad thing, just like excessively cutting, and usually after the first lesson the student is somewhat prone to being over-cautious about connections. Against players of their own level, that slowness doesn't usually work against them yet, and so they're often somewhat gratified at their successes in applying the concept. A little bit of positive reinforcement never hurt anyone. I do feel that it's important that whole issue gets addressed soon, usually when shape and efficiency start taking center stage in later lectures. erislover: Hey Agilis. Once upon a time I got a teaching game from you, and now as a 12k I've given quite a few myself. Here's how I like to introduce cutting and connecting, it seems to stick. I heard this from an 8kyu player that was instructing me for a while in my low 20s and it made a big difference. Let me know what you think. Rather than necessarily being about cutting and connecting, I like to put it in terms of attack and defense. I like to say that there is a yin-yang relationship between attack and defense. As the defender, you basically have two goals (in this order): keep your stones connected and don't get shut in. After all, you only get one stone per turn, and if you have two groups to watch over you won't be able to do both of them justice. So stay connected! To introduce the other idea I like to say that a group that is shut in (confined to the corner) has no more bearing on the game. They cannot attack anything, they cannot grow to get more territory, and so on. A good way to show this is from a simple 3-3 invasion of the 4-4 point and demonstrate that the opponent just invested x stones for y points and now those x stones are doing nothing more, while whoever had the 4-4, their stones will affect the rest of the game. Staying connected and staying free means your stones will have power and continue to affect gameplay. The 3-3 invasion is an illustration many lower kyu players can relate to (they hate it happening to them and love doing it to others, it seems) and it is a good illustration for "being shut in." If the defender's goal is to stay connected and not get shut in, the attacker's goal is obvious: keep your opponent separated (and hence weak) and if that is not possible, confine your opponent to the area they are already in. They share a fairly obvious relationship, so I like to call it the yin-yang of attack and defense. We see it all the time, beginners love to play as if go stones were magnets. As seen by various sabaki, tesuji, and leaning moves, attaching is a very useful thing, so I don't say that it is bad. However, I do try to explain things like this: "If I walk up to you and just push you for no reason, what would you do? Push back right? Well, here, black pushed white." From there, I try to show how it's natural for both sides to grow stronger from the attachment. This doesn't really convince them why attaching for no reason isn't recommended, so I use this contrived example of a leaning attack to illustrate the proverb of "don't touch what you want to kill." Starting with 4 stones on a 9x9, I say, "Let's say Black attaches to that marked stone, trying to kill it." Then proceed through that somewhat contrived sequence. Finally, at the end, I point out that lone white stone surrounded by black walls. I usually leave them with "Attaching is useful, but you need to understand what it does before you know how to use it." Bill: I think that the question of attachment or not is rather subtle and maybe better not taught to beginners. In particular I would not caution them against attachment, except perhaps when attacking. Being warned against attachment definitely hindered my progress, particularly in the area of sabaki. It's probably OK to say, "attachment for defense, but not for attack (as a rule)." Shape gets the least amount of time for the first lecture, but I feel it's important enough an idea to introduce, even if it's not remembered or understood early on. Just to get the basics of the concept of "shape" across, I pick on the posterchild of bad shape, the poor empty triangle. Using the explanation that "an empty triangle has 1 less liberty than any other 3-stone group, and in a close fight, 1 liberty means a lot." Then this is quickly followed up with how there are usualy, 99% of the time, a better, more efficient, way of doing something an empty triangle does. The key focus is that good shape is efficient shape. Examples of various common good shapes can follow, but by this time, usually 2-3 hours have passed and the student is often worn out or too overwhelmed to absorb much more. Remillard - I think this is good, but if in talking you get a feel that the person has a knack for finding shape, it can't hurt out to point out good shapes as they come up. So long as the focus doesn't get bogged down on shape. Efficient shape can come later, staying alive, and staying connected can be done efficiently or inefficiently, but doing them has a much bigger effect on the game at the very weak kyu levels I feel than shape has. Over the course of watching teaching games, I've come across one habit that I love and have since started using. I know I give long lessons, and I certainly don't expect even half of what I say to be learned in one shot. Subscribing to the shotgun theory, if 1 in 10 ideas stick clearly in the student's mind, and 3 of the remaining 9 "sound familiar" when I mention it later one, then it's been a big success. Because of those reasons, at the end of every lesson, I make up a set of bullet points. 2-4 things that the student, if they remember nothing else about the lesson, should try their best to keep in mind. Since I cover so much ground at a time, students are usually thankful to have something firm and definite to concentrate on. After the "beginner's spiel" I tend to teach whatever topics come up in games that seems interesting at the time, there's no specific order, just whatever seems to be in need of the most work gets priority. Why am I grouping these two topics together? Because a moyo-style is almost certainly one that depends on fierce fighting of a certain kind, and is usually the sort experienced by beginners. The other kind of fighting, close fighting with with groups a few liberties away from death is a different topic entirely. This section is a picture of how I like to teach people how to use a moyo that already exists. I'm not sure how to teach how to build a moyo on purpose, so I just teach how to use what exists already. This is a question that comes up quite often for people starting out, and it seems to me that the answer involves practice practice practice! What's the easiest way to have a large moyo? Why, take a large handicap of course! 5 stones and higher make for a pretty substantial moyo. What some beginner's don't notice is that stones which seem so far apart can constitute a whole-board moyo. I've found some people that don't like to take handicap stones. They feel it's some sort of insult, or that it's "not like the real game of go." I personally find that somewhat odd, because handicaps of all sizes, playing with or against them, teach important things. I'm a fairly aggressive player, especially with handicap stones in my favor, so I teach one thing about handicap games that I believe applies to moyos in the general sense. Handicap stones are for power, they're for the systematic attacking, squeezing, and if necessary, killing of the invader, all in the name of profit. This is why I lumped using moyos and basic combat into one heading. They're very much related. As for the actual teaching part, my experience is that it is a gradual process. 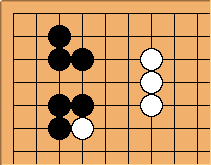 Over the course of the game, black will make slack moves and white will punish. So, when white shows more severe and effective moves, this amounts to teaching about basic fighting. And eventually, after a number of games, black should start getting a feel for how to attack white, how to defend a large moyo, when to sacrifice stranded groups for thickness, etc.. I think these are all things that have to be done and not explained. For example, how can we answer the question: "How do I know how far should I pull back to defend, or whether to try to kill?" with anything other than "With experience, and your judgement of the position." Actually, whole board thinking is one of my personal loves and obsessions, stemming from being generally weak tactically since I was 25k. The notion of "thinking about the whole board" sounds mystical for one very simple reason. It IS mystical. It's actually the culmination a great deal of thought about different topics, and only in the end, does a picture of "your stones work together" begin to form. That's why I don't believe you can teach it, you can teach all the component parts, and show examples, but in the end, the student has to figure it out on their own. What are these magical parts to whole board thinking? Well, the whole notion stems from the fact that, there are 19 lines on the board, and single stones, or single groups, over 10 lines apart but have a profound effect on each other. Early on, the first hints of this comes from thinking about the openning corner moves and what each openning stone intends to do. For example, take the 4-4 openning point. When a beginner first uses it, often they think it's for claiming the corner. Later, they learn that it's actually "for influence" (even though they have no idea what influence is and how to use it). Later, they learn that the 4-4 stone becomes more powerful with extensions down the side, and that that's "what the stone wants." At that point, they have enough materials to think about, potentially, whole board thinking. If they have a pair of 4-4's and white approaches, they have the tools to consider using a pincer of some sort, which combines attacking the white stone, with extending down the side to make, like perhaps in the diagram. Often this is also the beginning of questions about direction of play. Which side to block a 3-3 invasion, whether to pincer or to just play more peacefully. But _hark!_ this requires... knowing something about joseki! 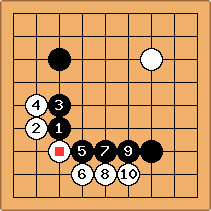 This would slowly start leading to thinking about which joseki emphasizes which side or what ideas. Then there's getting an idea of what other common openning stones, 3-4, 3-5, 3-3, etc., want to do before you can attempt to put a coherent plan together from a handful of stones. 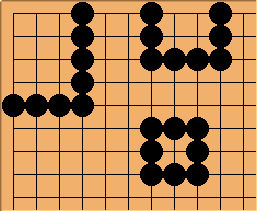 But beyond joseki choice (which is already a very difficult topic requiring knowledge of multiple joseki), as things head towards the middle game, whole board thinking involves considering the strength of groups, ways to attack, ways to build moyos, ways to invade and defend. Every step of the way, it takes having an idea of the potential ways something can evolve, so experience with fighting, large-scale or small, is another dimension. So, this is probably why I don't teach whole board thinking, it comes out of many many many basic principles. The very best you can do is mention, repeatedly, that one should pay attention and think about these things, but instead, we should just teach the underlying ideas, and let the big idea form on its own. Sometimes, playing just a normal teaching game on handicap, or on even gets to be a bit dull. So, here are some interesting things to play with that is different from normal games, but still teach something. I thought of this one for a particular student who seemed to refuse to think about what their moves did, I'm not sure whether it works well or not, but the people who saw it thought it was very informative. Materials: 1 student, 1 teacher, 1 game record of a game that is not the student's (preferably at or below student's level), audience optional. Procedure: Load up the game record, and the student has to review the game to the best of their ability for the teacher. The teacher helps as necessary, but tries to stay out of it until the end. Notice - "Reviewing" would not mean simply pointing out bad moves and moving on, but also providing potential variations showing why that move is bad and suggestions of better moves, with reasons. The teacher needs to guide the flow of the review, if the student is going too fast and is missing too much, slow them down, if they get caught up doing 50 variations of one position, tell them to move on. The whole point is to get the student to learn to analyze moves and look at them objectively, get them to try out variations to practice their reading of potential lines, lots of great stuff. What the teacher gets out of it is a much clearer picture of the thought processes of the student and now knows better about what might need more work. Side Note - I had the most fun using one of my own game records, saved from back when I was weaker than the student I was teaching. It's always fun to see the person who seems so strong and powerful make the exact same mistakes as you're making. Since as early as 22k I've given the occasional teaching game to total beginners. At that level, I couldn't do much beyond explaining the rules and showing a few bad things, but the experience forced me to think about what I was doing in order to answer even the simplest of questions. I dare say that teaching helped put some things into focus that I probably would not have thought about otherwise, and I've grown stronger for it. For this reason, I strongly encourage other players, even 20ks, to teach newcomers. So long as you're aware that you yourself are weak and have wrong ideas, and are willing to try hard and think about what you're teaching to overcome that, I can't see it doing anyone any lasting harm. In the end, some people discover that they are unable to teach, and others don't realize that they're unable to teach but try anyways. There are all sorts of people in the world and teaching requires a little bit of talent and training, just like any other skill, so it's nothing to be afraid of or ashamed about. But I firmly believe that it's important that everyone gives it a try if they possibly can. While I prefer it if people just commented directly into the text, here's a section for people who'd like to have a separate section to place their comments. Dieter: One can see you have really pondered the teaching thing. I wouldn't be too harsh on myself: you seem to do a very good job. I particularly like the action/reaction metaphor of macho pushing. I also very much agree with cutting and connecting being the fundamentelest of fundamentals, and last but not least, your vow not to explain too much. Perhaps I find some of your arguments too territorial, whereas it comes down to health of (future) stones, in my opinion. That's a minor note on an otherwise very interesting teaching weblog.